↑ ক খ Imperial Household Agency (Kunaichō), 昭和天皇 (124); retrieved 2011-10-16. ↑ Nussbaum, Louis-Frédéric et al. (2002). 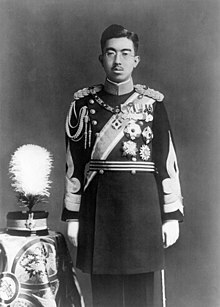 "Traditional order of Tennō" in Japan encyclopedia, pp. 962-963. ↑ Nussbaum, "Shōwa Tennō" at p. 889. ↑ ক খ গ ঘ Nussbaum, "Hirohito" at p. 318. Booknotes interview with John Dower on Embracing Defeat, March 26, 2000.